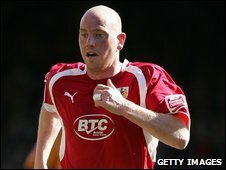 Forward Steve Brooker has joined Doncaster Rovers from Bristol City, signing a two-and-a-half-year deal and moving for an undisclosed fee. Brooker, 27, had a brief spell on loan with Rovers in November, scoring on his only appearance against Watford before tearing a calf muscle in training. "It was frustrating first time round," Brooker told the Rovers website. "I'm delighted to come back. It was important for me to go somewhere where there is a good group of players." Brooker, who is not yet fully fit, made light of his prospects at his new club. "Since I came here on loan, I've been watching the results and the team have been playing extremely well - so when I do get fit, I may struggle to get into the side." Brooker was with City for five years but his 101 appearances were interrupted by several injuries.